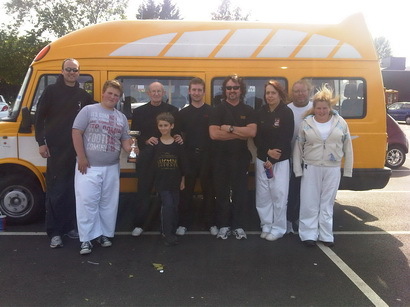 Firstly I would lke to say a big ‘thank you’ on behalf of North Devon Tae Kwon-Do to Ashley and the team over at Knapp House for the very kind loan of one of their minibuses for our little squad to safely get to Cardiff and back. It’s much more fun travelling as a team, not to mention all the sweets and yummy chocolate brownies that get shared around! Now I use the term ‘little squad‘ through choice because unfortunately so few people from our classes entered the event this year :-( So come on folks lets get a big team together for the next event, it’s only in Exeter after all, if you haven’t tried a competition before make this one your first of many! Lets have a BIG team we can support and cheer on. We now know what to buy both Adam and Matt for Christmas, anything Doctor Who! So the event itself, the reason we all went along. Considering it was the first time to compete for 3 of the 4 competitors. It was a very good day, an exciting an useful learning curve where I feel that everyone came home with a few new ideas up their sleeves for sparring techniques and a little more confidence in their abilities for performing patterns. 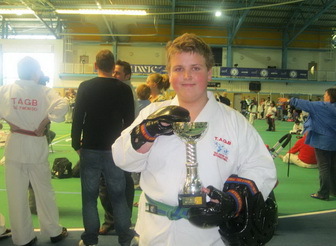 A big well done to Matt who beat off all comers…to take the glory of Gold in his category! 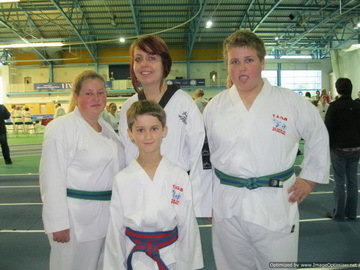 Thanks to all who attended and supported, in particular to Simon for driving us safely, Laura our new Florence Nightingale, all the officials who now have another stamp in their licences towards eligibility for grade promotion (take the hint if you didn’t go Black Belts!). Also to our official photographer and head cheerleader, Diane John.